Spread over 5 floors, this 32,000 sq/ft luxury Villa combines cutting edge technology with beautiful interior design, all helped along by a number of Future Automation products. 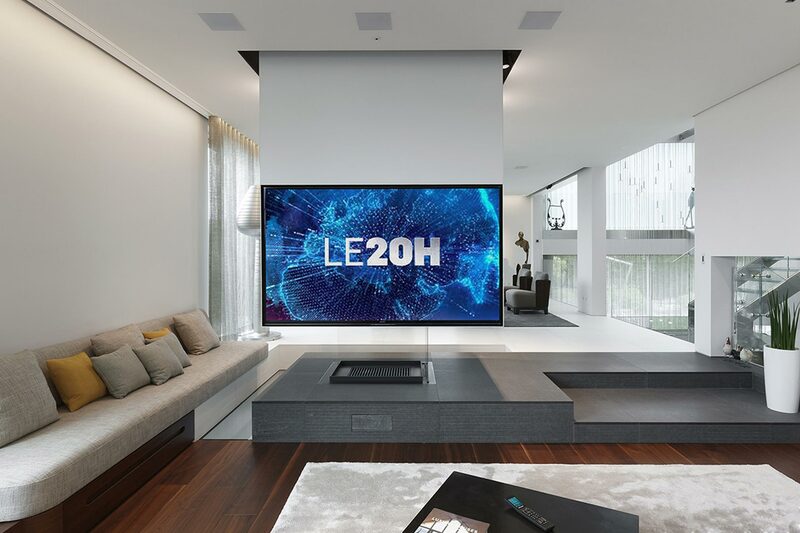 By working closely with Future Automation's French distribution partner, Pilote Films, Henri were able to overcome a number of issues caused by the villa's adventurous design. Starting in the master bedroom, Henri were faced with the issue of mounting a large format screen in a sensible viewing position without permanently obscuring their customer's view through the bedrooms floor to ceiling windows. Moreover, the lack of a supporting wall at the foot end of the bed meant a floor mounted solution would be required. To overcome this problem, the team at Henri chose the Future Automation 'PL' TV Lift, situated inside a bespoke joinery unit set back from the foot of the bed. Utilising a unique drop and roll flap mechanism the 'PL' TV Lift allows for a totally hidden flap system on top of the joinery work, allowing for a clean finish when the TV is in both the open and closed positions. Plug and play RS232 compatibility also allowed the mechanism to be easily integrated with the villa's home control system and operated via remote or touch screen. In the downstairs relaxation area, regular wall mounting was blocked by feature walls, hanging artwork and the swimming pool viewing area, so the customer decided a ceiling mounted solution was the way forward. 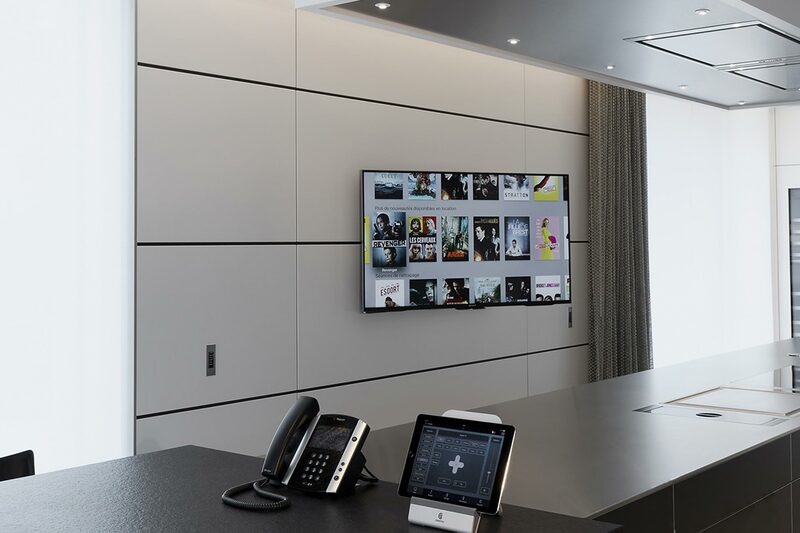 Future Automation were able to provide a bespoke length CM 'Ceiling Mount' for this application, enabling Henri to install the screen at a suitable viewing height, while keeping the power and source cables neatly managed inside the Ceiling Mount's stainless steel pole. Michael Sherman, Director of Henri, said "We are used to working with Future Automation products, meaning specifying and fitting is very easy for us now. At Henri we have our own internal engineering department in order to draw up every aspect of the design before actually installing the products, so we really appreciate the fact that we can easily access Future Automation's technical drawings and integrate them in our schematics. This way we know the integration is going to be perfect and we can easily satisfy the client and interior designer." 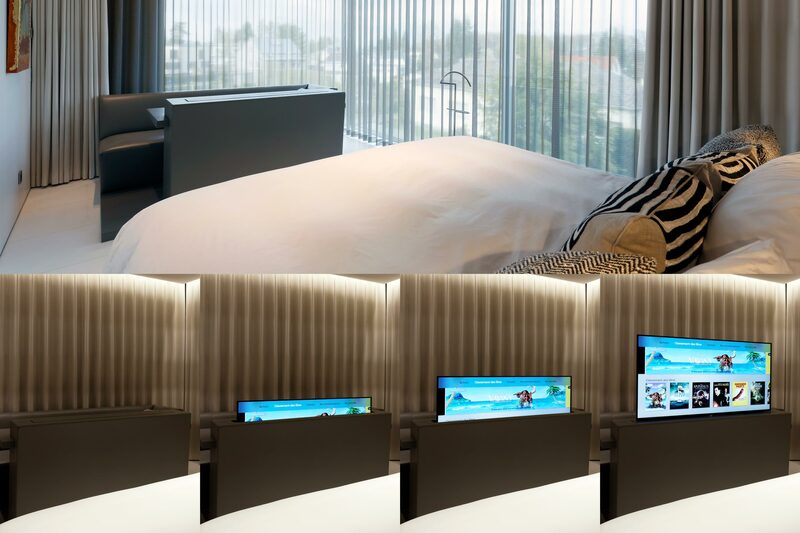 In another of the Villa's bedrooms, a manually rotating TV mount solution was required to cater for multiple viewing positions within the room. The team at Henri decided to the use the Future Automation 'FM' Floor Mount, with the stainless steel spun base being concealed within joinery work. The smooth bi-directional rotation of the 'FM' Floor Mount allows the user to rotate the screen to the desired viewing position, while the heavy base and joinery work keep any additional movement to a minimum. The built in cable management prevents tangling issues and adds to the clean finish provided by the joinery. Michael Sherman from Henri went on to say "We think Future Automation is the most qualitative brand when it comes to motorisation and mounts, which is why we specify their products regularly. The client for this project is very happy with the overall installation and the choice of Future Automation products was made with him so we were confident in meeting his needs. By looking at the pictures of the Villa you can see how meticulous we were with the details of the installation and thanks to the easily accessible drawings and information from Future Automation we were able to work within very tight tolerances." The villa features a number of Future Automation manual wall mounts as well, including PF65 Flat Brackets in the Living room, Billiard Room and Play Room, and a PS42 Articulated Wall Mount in the Kitchen. Ollie French from Future Automation said "Henri have provided their customer with a truly beautiful finished home and we are happy that our products were part of this project. They have used a mixture of our manual and automated solutions to great affect and we really look forward to working further with both Henri and Piloté Films in the future." Henri are an approved Future Automation dealer based in Paris, France. They integrate electrical and electronic technologies in renovation projects and in new constructions. The company is specialised in high-end projects that require a specific expertise in engineering, supervision and execution. Henri can be contact directly via www.Henri.fr or on +33 (0)143 285614, or through Future Automation's French distribution partner Pilote Films (www.Pilotefilms.com - +33 (0)149 001350). If you are a Future Automation dealer and would like to feature a recent install or project in one our of case studies, please contact a member of the Future Automation team.